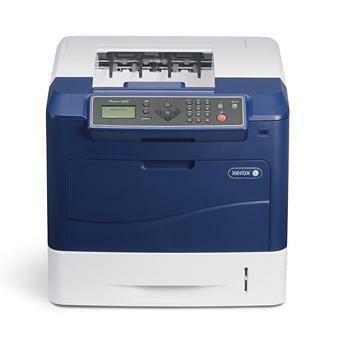 Designed for fast-paced offices with limited space, the Xerox Phaser 4620 is a compact yet powerful printer that delivers output with a resolution of 600 x 600 dpi and has a speed of 65 ppm. The impressive Xerox Phaser 4620 black and white laser printer boasts good quality output and has a large monthly duty cycle of up to 275,000 pages. This basic model does not have built-in networking or duplexing functions, however. The Xerox Phaser 4620 printer measures 18.7 x 21.3 x 16.5 inches and weighs 76.3 lbs. The Xerox 4620 laser printer has a cube-like shape and comes with an organised control panel. Optional paper trays are available to bring the paper handling capacity from 650 sheets to 2,000 sheets. For connectivity, it has a high-speed 2.0 USB port. The Xerox Phaser 4620 mono laser printer has a 700 MHz processor and comes with a 256 MB memory. Boasting an impressive print speed of 65 ppm, the black and white Xerox Phaser 4620 laser printer is very easy to use and offers support for most operating systems such as Macintosh and Windows. The Phaser 4620 is Energy Star Qualified and offers high yield consumables such as the high capacity black Xerox 106R01535 toner to bring the running costs down to a minimum. The Phaser 4620 may have low running costs, but the initial cost is a bit steep for a mono laser printer. The duplexer, Ethernet, and Wi-Fi are optional, and these upgrades are not cheap.